Snohomish County is Washington state’s third largest county with a population of 715,000 residents. Its county seat is Everett which is also its largest city. This area of northwestern Washington is located at the northern end of the Puget Sound and east of Whidbey Island. All cities in Snohomish County are situated near the Sound in the western half of the county; the eastern portion is mostly Mt. Baker-Snoqualmie National Forest. Blue Summit Realty has the most accurate and up to date Snohomish County real estate listings on the web. Currently there are 1,287 homes for sale, 229 condos for sale, 56 rental properties, and 388 vacant land properties in Snohomish County. 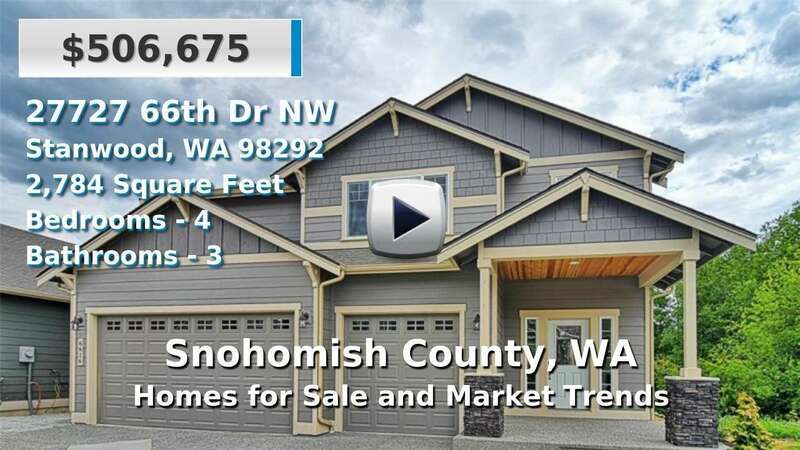 Of the 1,996 total Snohomish County residential listings for sale 16 are bank owned, 4 are short sales and 432 are new construction and 21 are townhomes. The price ranges from $89,000 to $7,200,000 with a median list price of $579,476 and median sold price of $477,013. Make sure to refine your Snohomish County real estate search by property type, price, square footage, bedrooms, bathrooms and more with the search tool above or view the Snohomish County listings on our interactive map. Our Snohomish County real estate listings were updated 7 minutes ago.